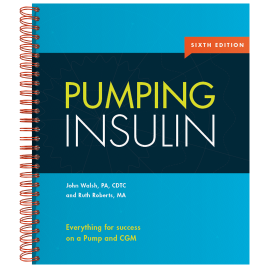 Roche acquired the durable Disetronic pump line in 2003 and then redesigned the pump and added additional features in multiple iteration.The newest, the Spirit Combo, is part of the Accu-Chek Combo Insulin Pump System. 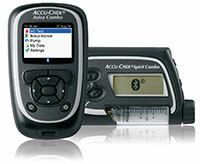 The new system includes the Spirit Combo insulin pump and the Aviva Combo blood glucose meter. A 315 unit cartridge that makes it easy to handle daily insulin needs as they change. Gives you the flexibility to adjust your basal rate to as low as 0.05 units/hour—in increments as precise as 0.01 units—and as high as 25.0 units/hour. Programmable reminders make sure you take appropriate actions when needed, including being able to set a reminder for changing your infusion set. The Bolus Advice function lets you use a current blood sugar reading to easily and quickly calculate and deliver a bolus with one device. It accounts for active insulin from previously delivered boluses to reduce the risk of accidental bolus stacking, which can lead to hypoglycemia. It also includes an option to deliver insulin via pen/syringe and stores that info in memory. The Aviva Combo blood glucose meter can control the pump for you. The pump can operate independently of the meter but using the meter allows discretion and convenience. The meter screen displays your current insulin pump screen so you don't have to keeping going back to your pump. Meter and pump communicate using Bluetooth, a safe, reliable and well known method of wireless communication. Downloads to Accu-Chek 360 Diabetes Management System or Accu-Chek Smart Pix device reader. Offer for free copy of 360 software and cable included in each pump shipment.